Did Ancient Egyptians Use Hair Gel? When we think of hair gel, we think of Elvis, Snooki...and King Tut. Yup. Believe it or not, a new study suggests that ancient Egyptians styled their hair with a fatty compound that resembles modern-day hair gel. In fact, some of the styles were even strikingly similar to styles seen on the red carpet today. Now that’s trendsetting. A research team led by Dr. Natalie McCreesh at the University of Manchester studied the hair samples of more than a dozen male and female mummies, both young and old (if you can call a three thousand-year-old mummy young). They found that some mummies used this “gel” on their hair both in everyday life and in preparation for death, which gives scientists new insight into two fascinating areas of study. “We have known that hair was important to the ancient Egyptians, yet never before have we seen the use of ‘product’ to style the natural hair. Most other research has focused on wearing wigs,” McCreesh said, explaining that research suggests more noble Egyptians wore wigs. 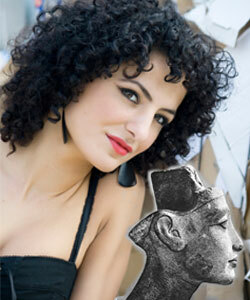 That may explain why most peoples' ideas of Egyptian hair conjures up images of Liz Taylor as Cleopatra. The gelled styles discovered on both male and female mummies ran the gamut from short and curly, to long and wavy. Some children even wore short styles slicked back and to the side, McCreesh said. Apparently mummies knew how they wanted their ‘do done, just like us! So where can we get our hands on this time-tested (literally), all-natural hair gel? Well, that’s where you might have to be patient. The exact recipe is still a mystery to scientists. It contains palmitic and stearic acid, but from there it gets a little fuzzy. Until then, you’ll just have to stay tuned. It seems the real secrets of the tomb are yet to come!